Every businessperson knows that good data makes you smarter. Well, a truer statement might be that an accurate analysis of the right data can make a company smarter, but lack of any data can be fatal. Using a tool like Google Analytics is one way that many businesses monitor and analyze traffic coming to their web site, pay per click advertising conversion and keyword search terms attracting prospects. But, Google Analytics, while offering a powerful suite of analytics and conversion tools, has one increasingly fatal flaw – by the time you get the data, it’s already old news. Today’s reliance on the web and social media requires real time tracking and analytics that are delivered in real time. This isn’t just a way to feed the obsession over traffic and other sometimes meaningless stats, this is a valuable way to view and react to business opportunities as swiftly as they arise. Speed may indeed be the most important competitive business advantage. React to mentions of you brand more fully – You’ll know the minute your business has been mentioned by a blogger or other online publication and the implication that mention may have in terms of traffic and potential reciprocal reactions. You may choose to go comment on every post that mentions your brand, but you may really make it a priority to comment on a post that is sending buckets of traffic your way. Interact with site visitors live – You’ll get a view of who is visiting your site in a live mode and witness where they came from, what paths they take and where they exit. You can tag customers from your database and know when they are on your site. Some real time stats packages actually allow you to launch a browser chat session with a specific visitor that, say, clicks on several links like they are looking for something. Watch your test in real time – You can track A/B split tests and see immediately not only what page is getting conversions, but what visitors are doing and not doing on each test page. I think this might allow you to make your testing adjustments much faster and more accurately. Test your PPC campaigns in real time – Google AdWords data is often hours old and, in my experience, not terribly accurate. By monitoring a new ad campaign in real time you can know immediately which ad version or which landing page version is a winner in a matter of minutes. Understand the impact of your blog posts – I’m still puzzled sometimes by the reaction to my blog posts. I find it very hard to predict when something I’ve written is going to catch fire. With real time stats I know within minutes of publishing if I’ve happened to spark a reaction with readers and that gives me the cue to get proactive about promoting the post in bookmarking sites and social networks much more aggressively. I don’t like to promote everything I publish in this manner, so this gives me the filter to know when to amplify big right away. There are by my guess dozens of packages available that can help you get web site data in real time. Some are free, some are actually very expensive. Below are three that I think are worth a look for small business owners that are serious at all about leveraging their growing web presence. Woopra – This happens to be the tool I use and really love the interface. The stats are delivered via a java download app that sits on the desktop. You can create filters to view and analyze everything I’ve mentioned above. 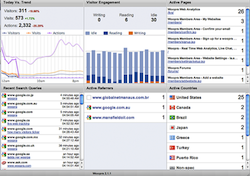 The tool also features a live view of visitors on your site that is mesmerizing. Live chat launching is also available. Woopra packages are based on traffic. Clicky – This tool does most of what you would expect from a real time stats package but with a little more emphasis on social media. The interface is simple and doesn’t suffer from trying to do too much. There is also a white label version so marketers and SEO folks can offer Clicky tracking to clients as well. Mixpanel – I like the marketing emphasis on Mixpanel. Two baked in features that a lot of marketers will like are event tracking and funnel analysis. You get a linear view of your events, like ad campaigns, that makes it very easy to get a snapshot of the entire event without having to link actions together. For some, the idea of a monthly fee for the benefit of stats in real time may feel excessive, but in the increasingly competitive web world, the businesses that react the fastest win.